Bethesda and ThreeZero have been collaborating to bring some elements from the post-apocalyptic world into our real world with the Fallout 4 T-45 Power Armor action figure. Want to deploy him into your showcase? Let’s keep going. 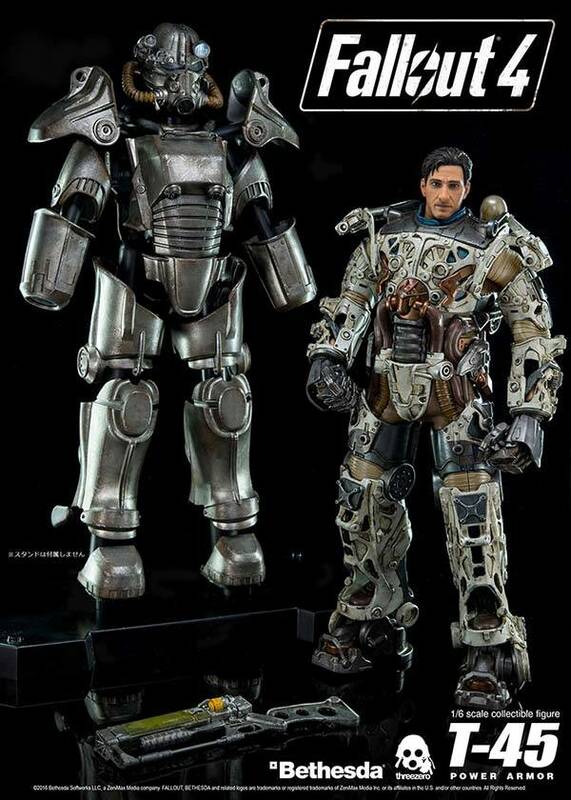 This is a pretty cool and powerful 1/6 scale action figure themed by Fallout 4, the latest installation of Fallout video game series. The action figure is designed based on T-45 power armor, one of the most iconic power suit sets in the wasteland. 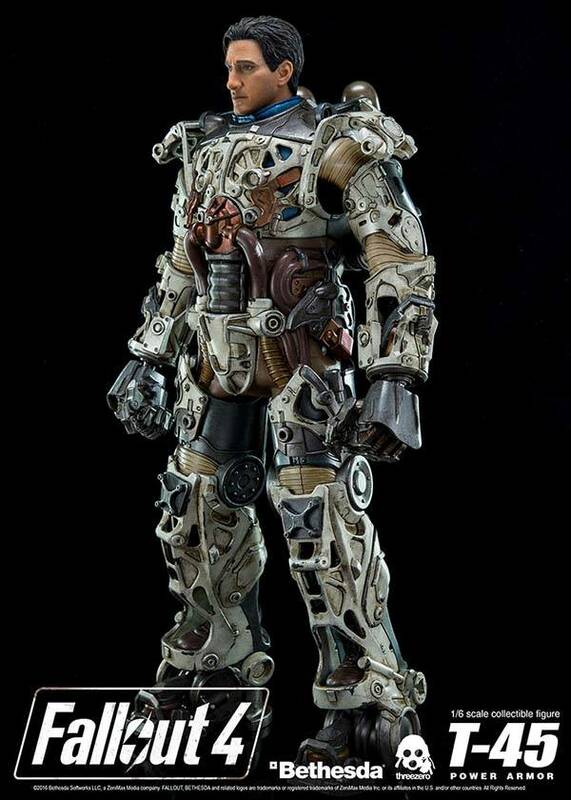 As shown in the images, the premium figure shows off incredibly detailed painting to meticulously depict every detail on the power armor, and we even can see weathering effect based on the appearance in the video game. Furthermore, all outer-armor pieces are detachable in order to show off detailed endoskeleton that allows you to detailedly learn the internal structure of T-45 power armor, and the outer-armor pieces are interchangeable with upcoming FO4 Power Armor figures. Moreover, the action figure measures 14.5 inches tall and features over 35 points of articulation including articulated fingers, and with included AER-9 laser rifle, exchangeable make head and helmet with a light-up LED function, you can recreate many classic postures and scenes in Fallout 4. 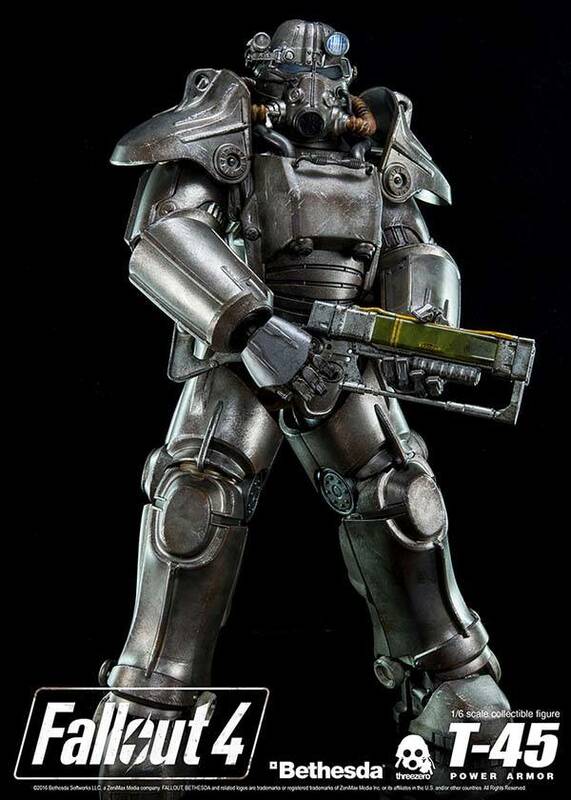 The Fallout 4 T-45 Power Armor action figure is priced at $359.99 USD, and its exclusive version will set you back $398 USD. If you’re interested, jump to BigBadToyStore or ThreeZero for its more details.